When you start clicker training your horse you might want to start with something fun and measurable. Key Lesson Mat training is an excellent exercise to start clicker training your horse. It’s a very simple exercise to train and easy to understand for your horse. What does Key Lesson Mat training look like? Your horse steps with his 2 front hooves on a mat. Soon you can train for duration and teach your horse to stay on the mat. Mats can become ‘safety blankets’ because of their positive reinforcement history. If the horse spooks there is a huge chance that he will look for the mat to stand on to give him comfort. In this video you can see what happens when Kyra spooks: she doesn’t run to me or run me over. Instead she runs to the mat for comfort and safety. Super powerful benefit, wouldn’t you say? Teach your horse to stand on other (unfamiliar) objects like tarps, pedestals, trailer ramps, wooden bridges, hoof jacks, into a bucket of water and so on. If you think this is a blog that someone can benefit from, please use one of the share buttons below. I’d love to read your comments about this topic, I read them all! Preparing for a hoof stand. If you don’t know what to say, simply hit the like button so I know you appreciated this blog. Thank you! Recently I started training the rescue horses at the BC SPCA. I was asked to help (re)train the horses with positive reinforcement, since that is my specialty. Would my training benefit the rehabilitated horses in terms of welfare? Is negative reinforcement training better in terms of welfare or is a horse better off with positive reinforcement training? I found a possible answer in a study done at the University of Wales, UK. The aim of their study was to compare these training strategies (negative versus positive reinforcement) on equine behaviour and physiology as the first step in establishing an optimal rehabilitation approach (from a welfare perspective) for equids that have been subjected to chronic stress in the form of long-term neglect/cruelty. They trained 16 ponies with basic tasks like trailer loading, lead by hand, traverse an obstacle course, etc. During training the heart rate was monitored and ethograms were compiled. In addition each week an arena test was done. The training lasted for 7 weeks. After all data was compiled there was a significant difference between the two methods. They found that ‘animals trained under a positive reinforcement schedule were more motivated to participate in the training sessions and exhibited more exploratory or ‘trial and error’ type behaviours in novel situations/environments.’ (in comparison with the horses trained with negative reinforcement). These results support my own experience with positive and negative reinforcement. The end result of the training may be similar but the experience for the horse is significantly different between positive and negative reinforcement. We have all encountered times when we think “Now what?” at the barn. Maybe you have already reached all your equestrian goals, maybe your horse became sick and needed rest, maybe you got injured, maybe you just bought a young horse, or a senior horse… We all need inspiration if we don’t know what to teach our horse next. In HA you have to navigate your horse through an obstacle course while focusing on clear communication and positive horsemanship. Horse and handler are both on foot. Horse Agility can help build a very close relationship with your horse and it keeps your horse’s mind working constructively. Skills developed in HA are very useful in daily routines as well as in new and possibly scary situations. You can even enter online competitions these days where you send in a video. 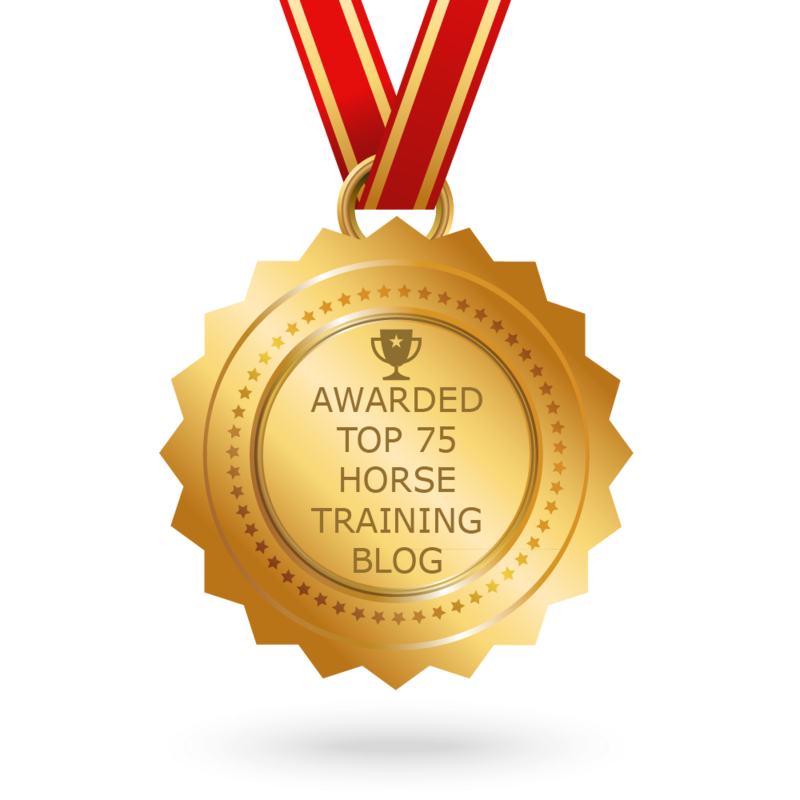 TT is a great way to improve the relationship with your horse. You become aware of your horses intelligence and it is a fun way to spent time together. There are many simple tricks that are suitable for horses of all ages, like smiling or playing fetch. Some exercises are beneficial and can increase the horses strength and flexibility like the classical bow or the back crunch. If your horse already knows a lot of tricks, you can start improving your husbandry skills. Ever thought of teaching your horse how to be dewormed easily or preparing him for oral medication you might need to give him some day? Teach him to accept eye drops or ointment, practice hoof trimming, braiding, taking your horses temperature, teach him to stand in a bucket of water in case you need to soak his feet. The possibilities are endless and you never know when these skills come in handy. Best way to train this is if there is no goal or time limit yet. Read here the 4 reasons to start practising trailer loading today. If you don’t own a trailer, this is worth renting a trailer for. There are so many situations in which water is involved. During the summer months you can have fun water proofing your horse. Think of soaking hooves in a bucket, hosing down your horse, crossing water (river, water splash, muddy puddles), water obstacles in HA, going for a swim with your horse, spraying your horse with a plant spray and so on. I hope I have given you some ideas to expand your horizons. Have fun! Trailer loading can be a huge issue for horse people. Why? 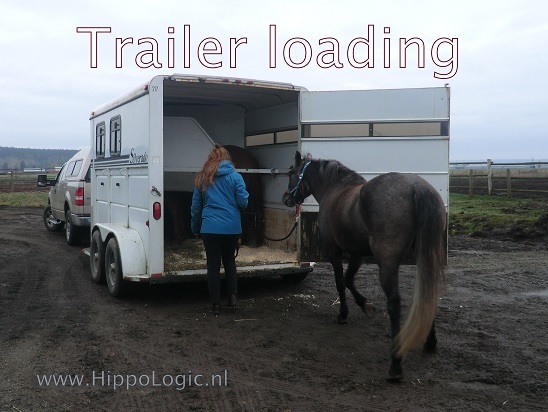 There are 2 components in trailer loading that play a major role: the horse and the handler. The horse plays a big role. If he is fearful to go into that little box on wheels, it makes us nervous. Who wants to stand in a small box on wheels, next to 1000 pounds of unpredictable and unwilling animal that is trying to escape instead of willingly walking in? Fear plays a major role in most trailer loading issues. In this blog I am not talking about the fear in horses. I think they can be trained away the easiest. I am talking about the fear of the handler leading the horse into the trailer. I know I had trailer loading issues myself. People always thought I was joking when I said:”I have trailer loading issues” or “I have trailer fear”. Most people didn’t take the “I” in my sentence literally, but I really mean it that way. – What if my horse gets injured in the trailer, during loading or during the drive. – What if the trailer or car gets a flat tire on the highway? – What if I get injured while loading a nervous horse into a very small space? Especially when I was pregnant this was a big fear. – What will people think of me if I can’t load my horse? – What will people think if they have to wait for me while I am loading? I don’t want to be a burden, they probably hate waiting, they might think I am doing it wrong, etc. – What should I say if people want to ‘help’ me load my horse and want to use pressure or force my horse? – What will they think of me when I decline their help? I don’t want to offend them by saying “Thanks, but no thanks”. – What if she panics and runs onto a busy street? There are other factors that can play a roll as well like impatience or stress in the handler. It can be that you’re only worried or afraid when loading your own horse. I have loaded other peoples horses smoothly when the cause was the handler. With other peoples horses I didn’t have the fears I named above. Part of it was when the horse was in the trailer, it didn’t feel like my responsibility anymore. And I was never in a hurry because I was helping people out that were desperate and ready to take (wait) the time it took to load the horse. Back to my own situation. The moment I realized part of the problem was me, I was stunned. Was I part of the problem? Really? Have you ever noticed that what you are focusing on grows? My fears stayed intact because I was repeating them over and over in my mind. It is like a fire and as you keep feeding it, it grows and takes on a life of its own. Instead of being relieved that Kyra got out of the trailer perfectly fine and without any injury whatsoever, I kept telling myself that I was afraid of her being injured and developing a trailer issue. As soon as I realized this, I started focusing on what went well and on all the improvements I had already achieved. Small improvements like every second ‘building duration standing in the trailer’, ‘standing more relaxed in the trailer’ as well as the big improvements ‘pulling me towards an open trailers to get in’ and ‘she didn’t poop out of stress’. Writing down my successes and filming the process helped incredibly. If you are familiar with clicker training, you already know this. I also realized that we are in a process. It takes time and every time I could build on the foundations of trailer loading I was building on the solid behaviour I am longing for: a confident horse that loads easily and enjoys the ride. I don’t get nervous anymore if people are watching or waiting while I load Kyra. I realize that the relationship I have with my horse and my horses feelings are worth much more than what I think other people are thinking. After all, I don’t know what they are thinking… I refuse to stress my horse by pressuring her, because of my (irrational) thoughts. I don’t want to force her anymore. Ever. What also helped to reduce my fears, is to make the trailer and the ride as comfortable as possible. In this way I can relax better while traveling with my horse. 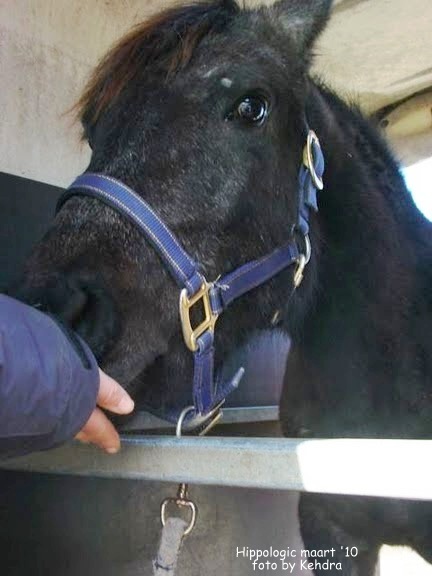 Like a light, roomy trailer, an anti-slip floor, shavings and a hay net so Kyra can nibble away, a experienced driver who drives defensively and so on. We are still working on a self loading horse. I am sure we can tick that off of our list of goals in 2015.